After preparing the discs and the buffer/amplifier in Part 2 of this series, I looked around for different instruments that could effectively be amplified and recorded with the use of piezo elements. 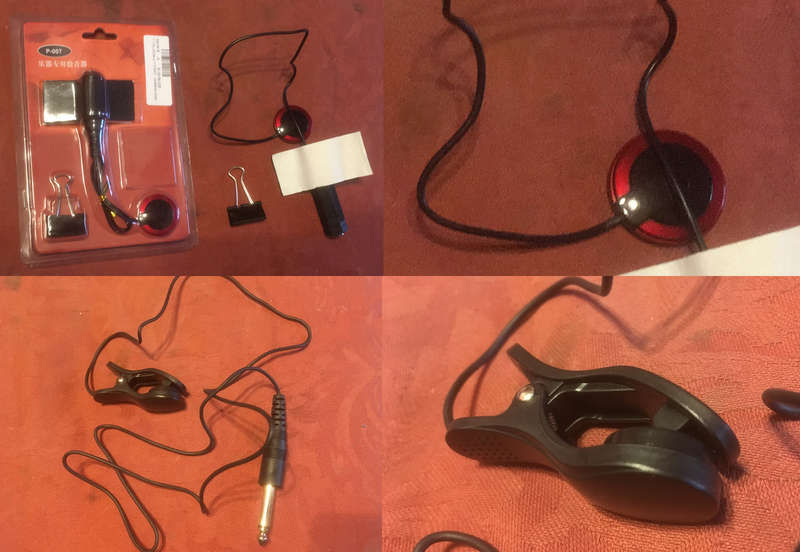 The top one (Cost: approx £1.50) has quite a large piezo disc inside a plastic cover and a sticky pad to fix it to the surface which is to be amplified; the bottom one (Cost: £1.25) is built into a (not-too-strong) plastic clip, with a foam pad to protect the disc. 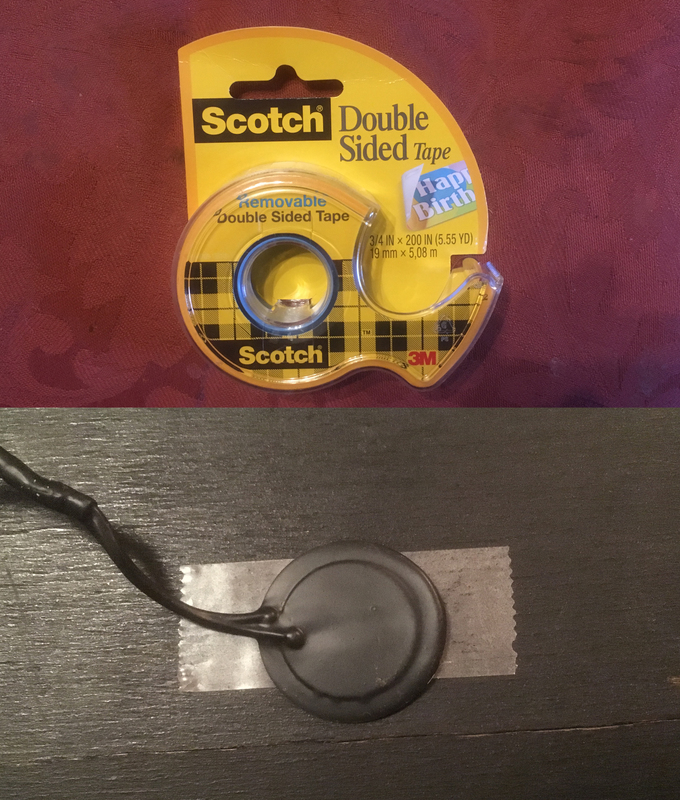 This double-sided tape is described as ‘removable’, and is less likely to damage either the piezo element or the instrument it’s stuck to, so is a good choice – although, at about £7.00, was rather expensive. I hope to make use of it elsewhere in the house! It’s also more suitable for a one-off performance or recording. 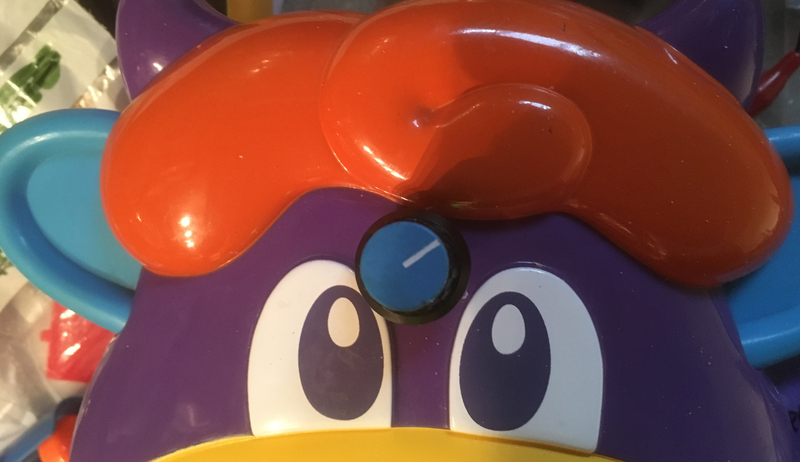 I’ve also read that Blu-Tac works in a similar way, although my experience is that it can leave marks; elsewhere I’ve read that insulating tape can be used – that might also be less sticky than conventional sellotape, but unlike the double sided tape, would have to go over the top of the piezo disc. 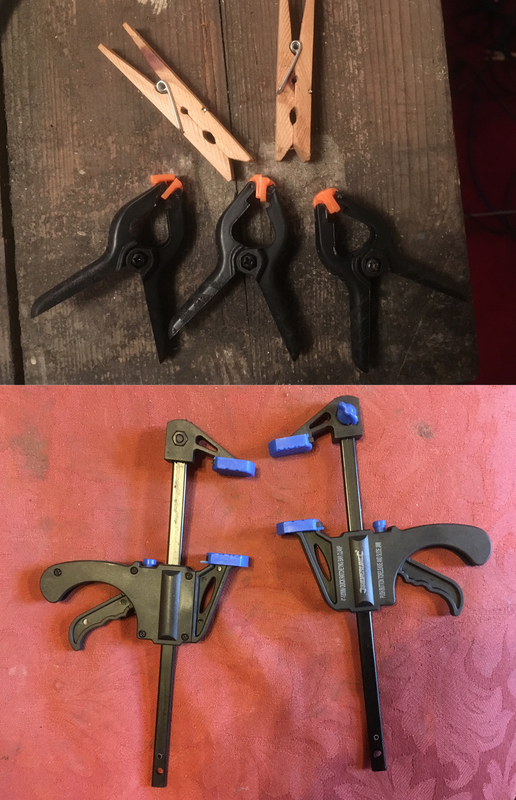 The spring clips were very strong, so I would guess I’d have to be careful using them so as not to damage the piezos. I have read of people using soft pads – made of felt or foam rubber, for example – to put over the piezos when using them with strong clips. In this way I had a variety of different methods of attaching the piezos to items I wanted to amplify or record. The items themselves could be either acoustic instruments that just needed appropriately amplifying; or items that were not musical instruments, but which could be amplified – perhaps changing their sound, or revealing a hidden sound in the process – by attaching a piezo. 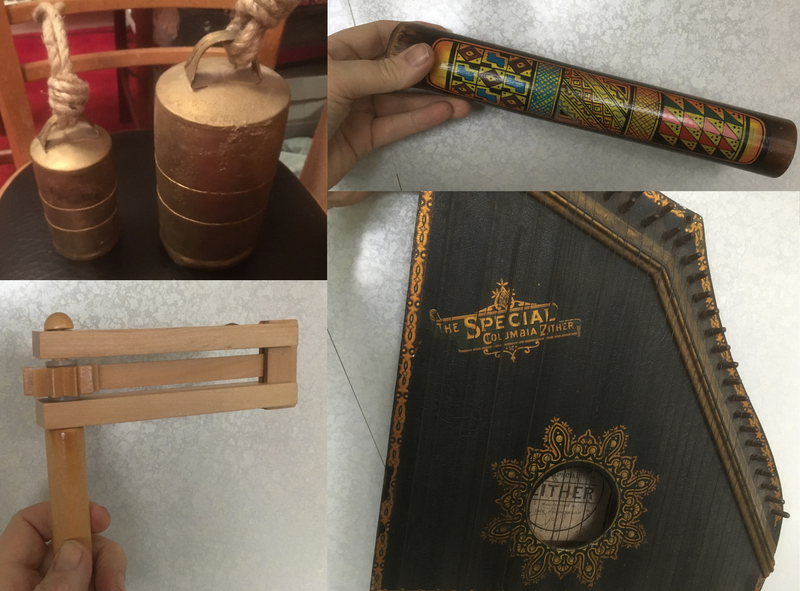 As they are used to pick up sounds from vibrations in solid surfaces, the best acoustic instruments to work on would be those with sounding boards, such as guitars, zithers or other stringed instruments, several of which I had in my collection; as for non-musical instruments, this would be a matter of experimentation! 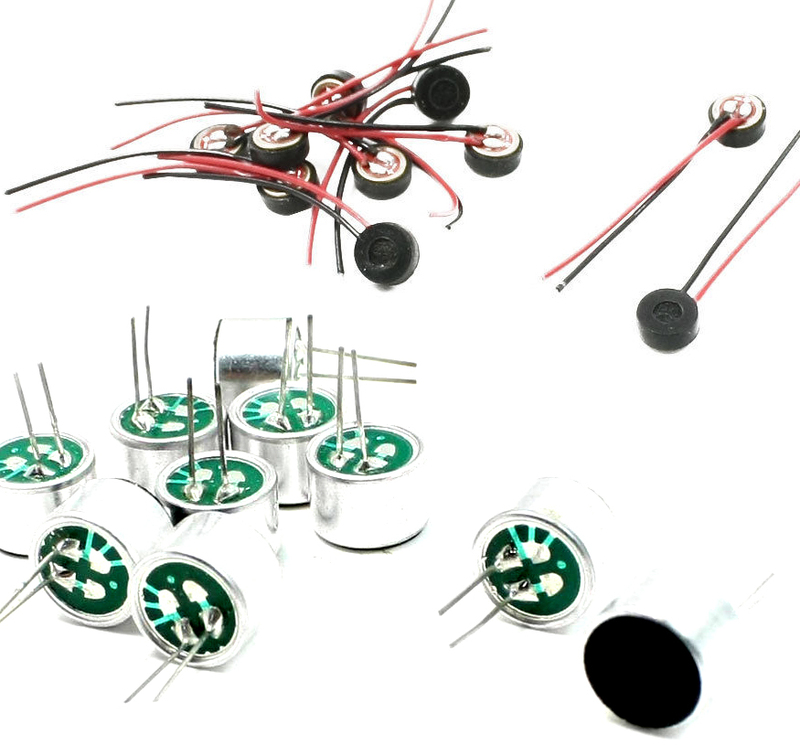 The advantage of using a piezo contact mic in these examples would be that, unlike a conventional microphone which picks up airborne sounds, the contact mic wouldn’t easily be affected by the nearby sounds of the player, other instruments, or external noises in the recording environment – e.g. traffic or the people next door. First of all, the more conventional instruments. These are just a few of the various things I tried the piezo mics with. At the top are bells and a rainstick; at the bottom are a rattle (not perhaps, strictly speaking, an instrument!) and a zither. In these experiments only the zither was recorded in stereo by using two piezos, but a stereo effect would certainly bring something to some of the others – for example the rainstick. Next, some uses of the piezos that created new instruments in themselves. Both of these made sounds that, when picked up by the piezos were very different from the way they sounded in the room. The first one uses a small snare – normally used for a snare drum. 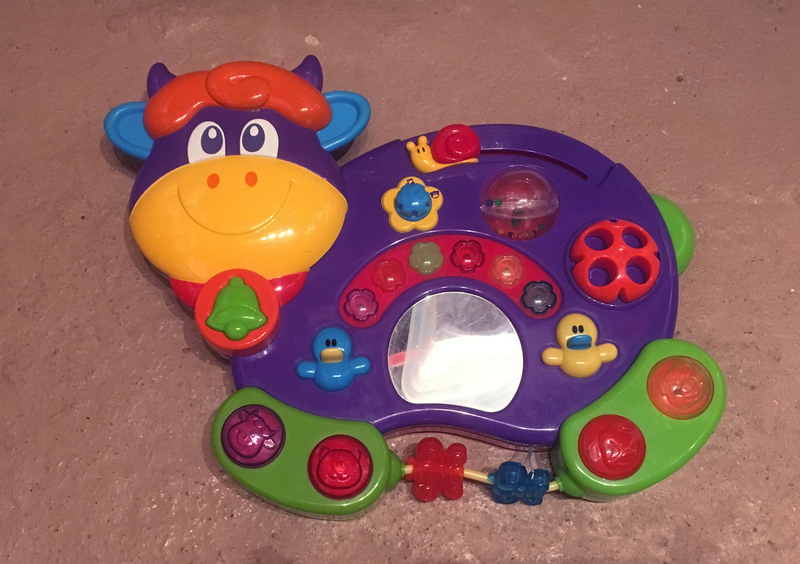 This was purchased very cheaply (about £1.30) and attached to a wide, flat tin. A 50mm piezo disc was superglued to the middle of the tin. 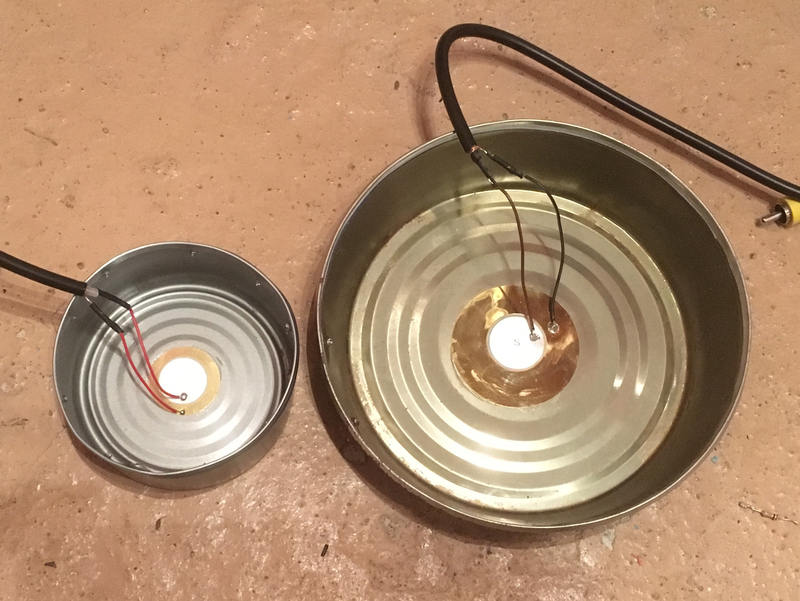 The second one is just a 50mm piezo disc with 4 lengths of piano wire soldered to it. I’m not 100% certain of the diameter of the wire: it said ‘G0’ (i.e. ‘G zero’) on it, and was bought from a (classical) music shop about 30 years ago. If it means Music Wire gauge 0, this would make it about 9mm, something like a thin top E guitar string, which is about what it seems to be. The 4 lengths are approximately 6″, 9″, 12″ and 18″. 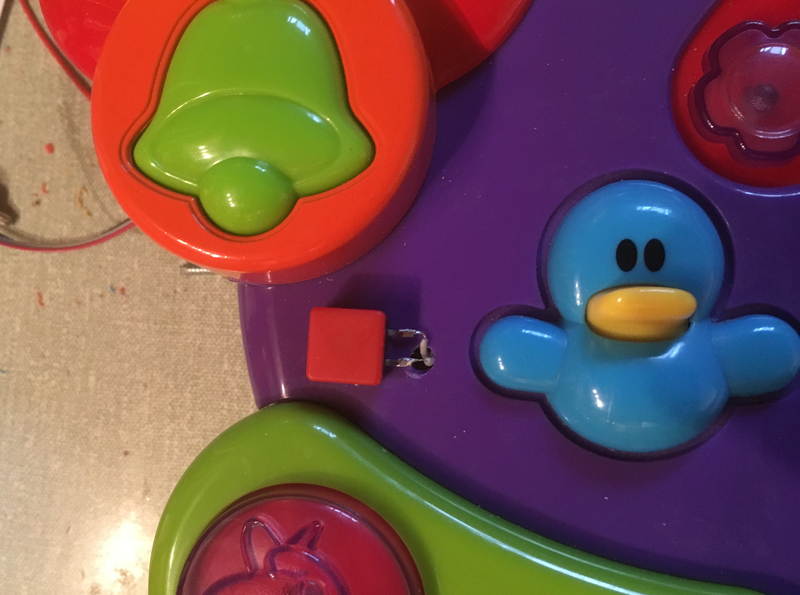 It’s surprising how different the sound through the piezo is, compared to the natural sound, especially the one with the soldered strings, which makes hardly any noise at all. The small preamp also plays a part in preserving the lower frequency sounds. The picture below shows, on the left, the three – I don’t know what to call them – strikers or activators, which I used to make the sounds from the snare instrument: the one on the left is a home made beater or mallet, made from a length of dowel and a wooden bead; the middle one is a wooden coffee stirrer, much more delicate; and the one on the right is a small cleaning brush. It’s a good idea to make a collection of these if you’re going to make piezo instruments, as the way you interact with the instrument can make a big difference to how it sounds. The picture on the right shows some more things I use, as well as pipe cleaners, fire-lighting spills and small emery boards. This writer has a very impressive collection: https://skoglosa.wordpress.com/2015/05/06/contact-mic-guidelines/! The instruments required quite a bit of physical construction, since a framework was needed to support the sounding parts. 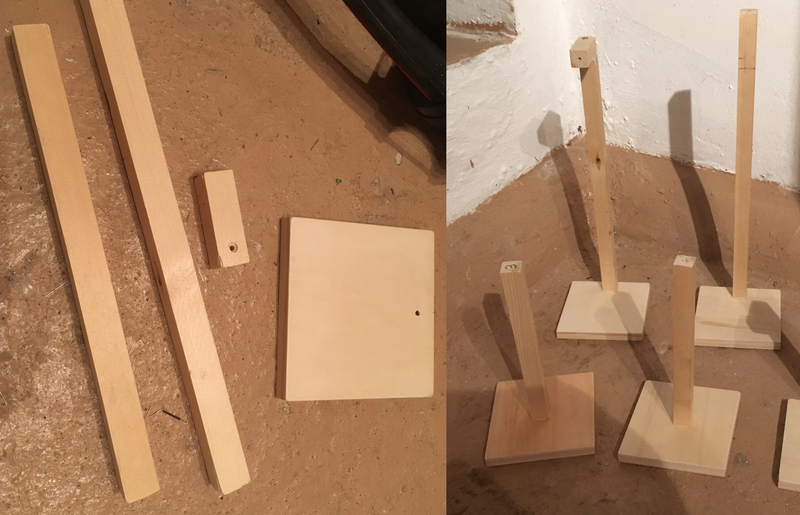 I bought some small square trays to serve as the bases, and cut lengths of 2x2cm wood for the uprights. 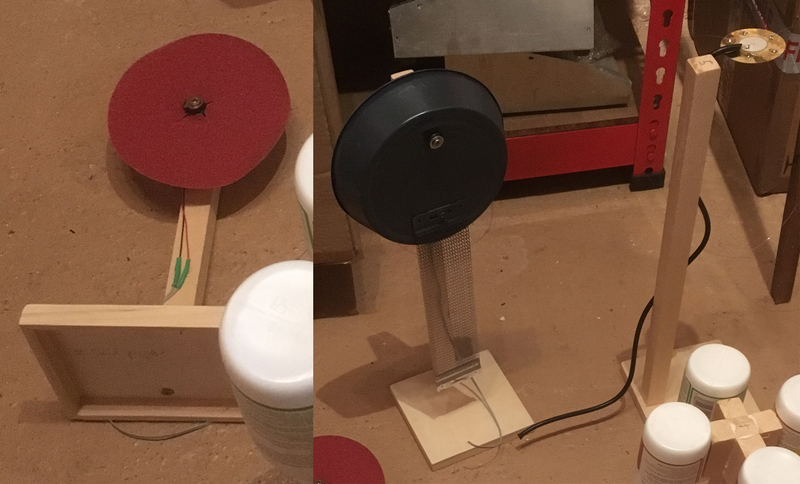 The two on the right are the ones described earlier; the one on the left is simply a sandpaper disc with a 35mm piezo glued to the back. The narrow space underneath the base can be seen in this picture. The batteries and electronics would have to fit in this space. 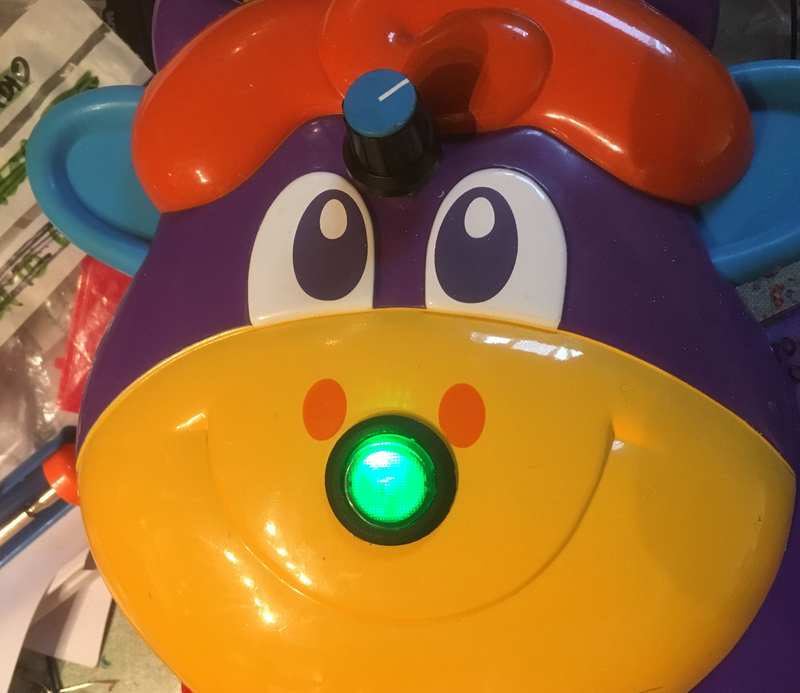 After the physical construction, it was time to add the electronics. I’ll describe this in the next part of the series. 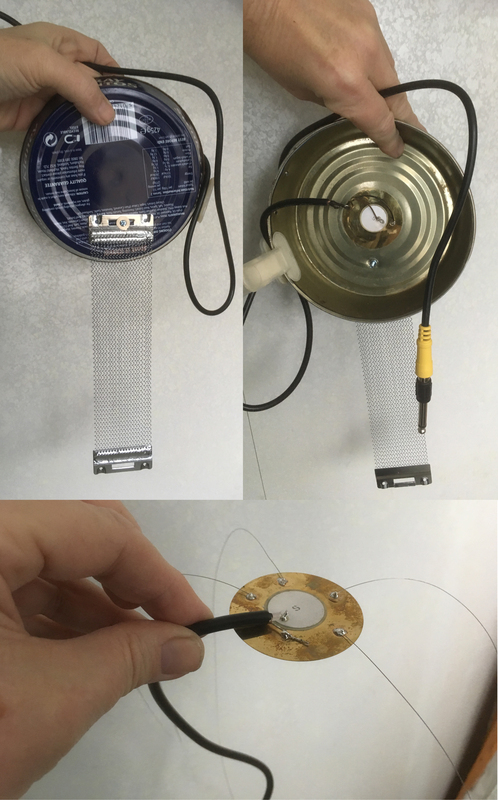 After starting my recent piezo project, I decided to look into electret microphones – there are many situations in which a piezo-type contact mic is less suitable than a mic which detects sounds in the air. It’s possible to get them without any wires – long or short – attached, but I preferred these. The smaller ones, illustrated at the top, were very small – 4mm in diameter; the larger ones were 10mm. I also bought a few that were in between, at 6.5mm. Most people working in electronic music will be aware of the importance of microphones, and I have some quite expensive ones for different amplifying and recording purposes; but there are various situations in which a very low-cost method of picking up and amplifying sometimes quite small sounds can be all that’s needed. One renowned electronic music composer for whom the microphone became extremely important for a time was Karlheinz Stockhausen. ‘One day’, he continues, ‘I took some equipment from the WDR Studio for Electronic Music home with me. My collaborator Jaap Spek helped me. 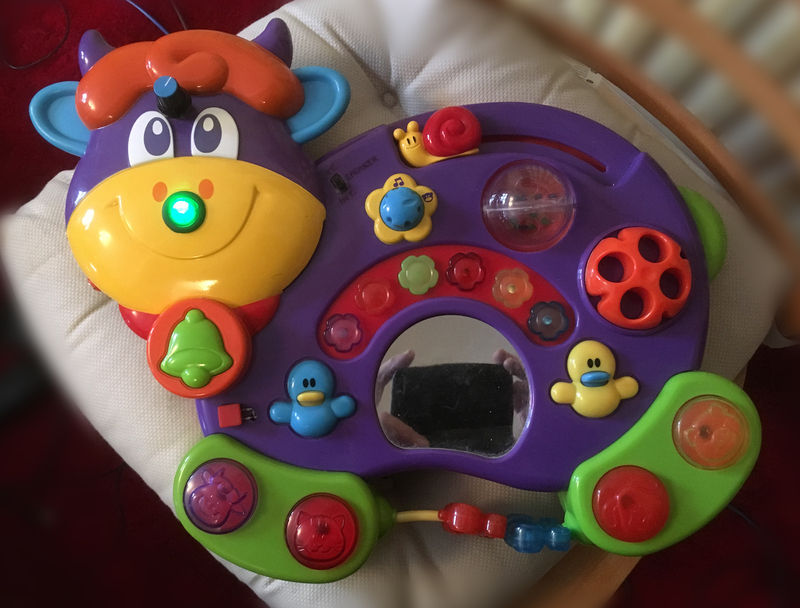 I played on the tam-tam with every possible utensil and during this, moved the microphone above the surface of the tam-tam. The microphone was connected to an electrical filter whose output was connected to a volume control (potentiometer), and this in turn, was connected to amplifier and loudspeaker. During this, Jaap Spek changed the filter settings and dynamic levels, improvising. At the same time, we recorded the result on tape. The score includes instructions for the placing and movement of the microphones, just as it includes instructions for the tam-tam players and the filter operators, so the microphones can be regarded as essential instruments in the performance of the piece. 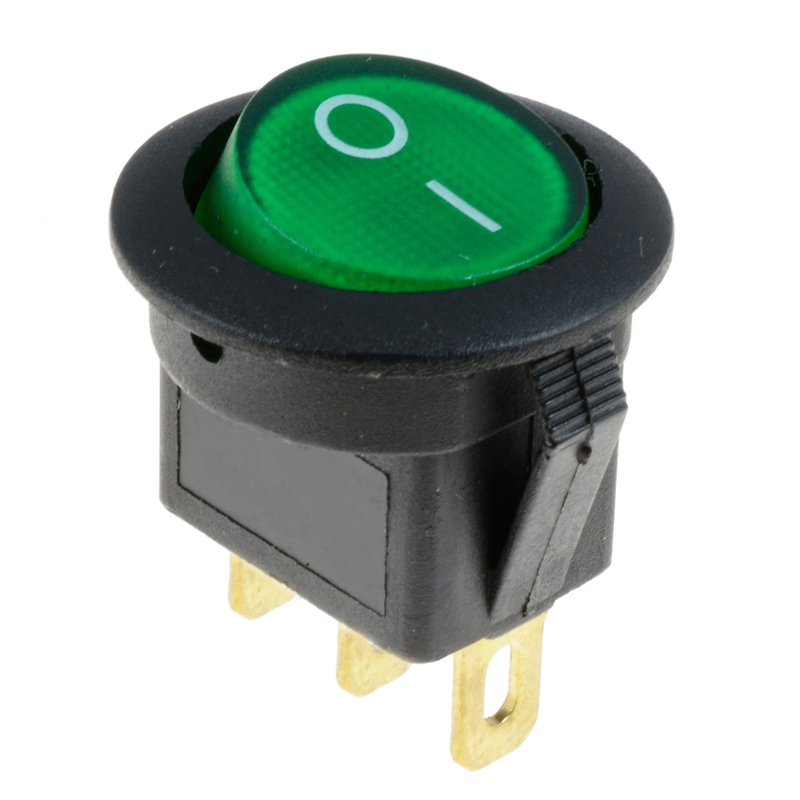 These electret capsules won’t work, however, just by connecting them to a mixer or amplifier – they have a small built-in preamp inside them which needs power to operate it. 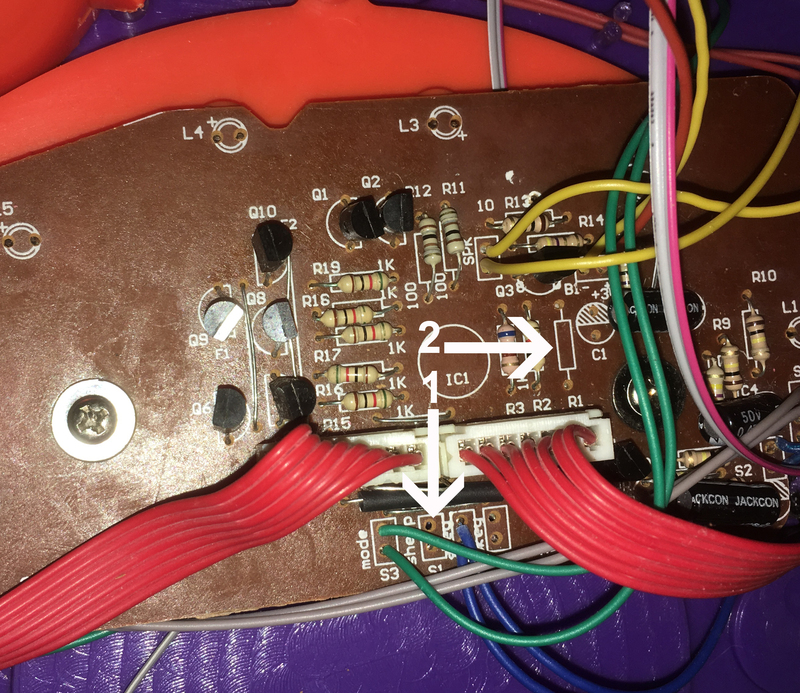 This means the positive lead to the capsule must have a few volts of power running to it – 3v to 9v, typically – for the capsule to work. An interesting article on this topic can be found at http://www.epanorama.net/circuits/microphone_powering.html. 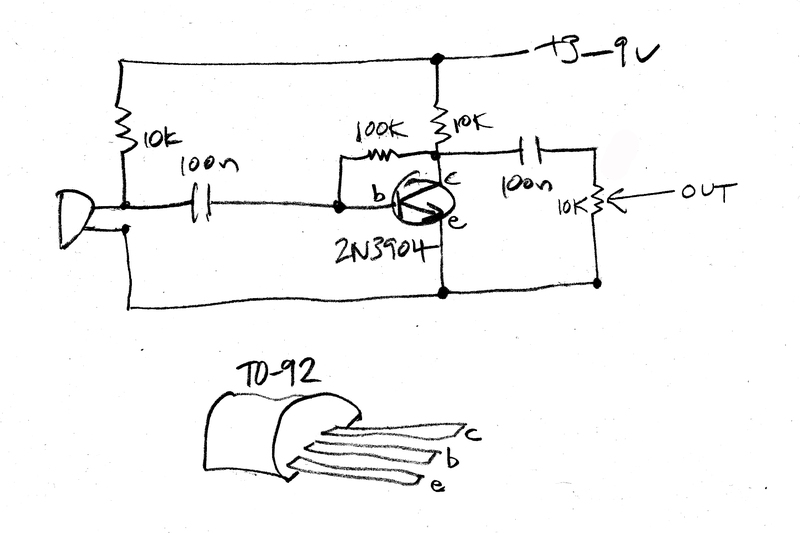 Using a prototype of this circuit with the Taurus amplifier, the level of the signal was perfectly good enough without any additional circuitry. 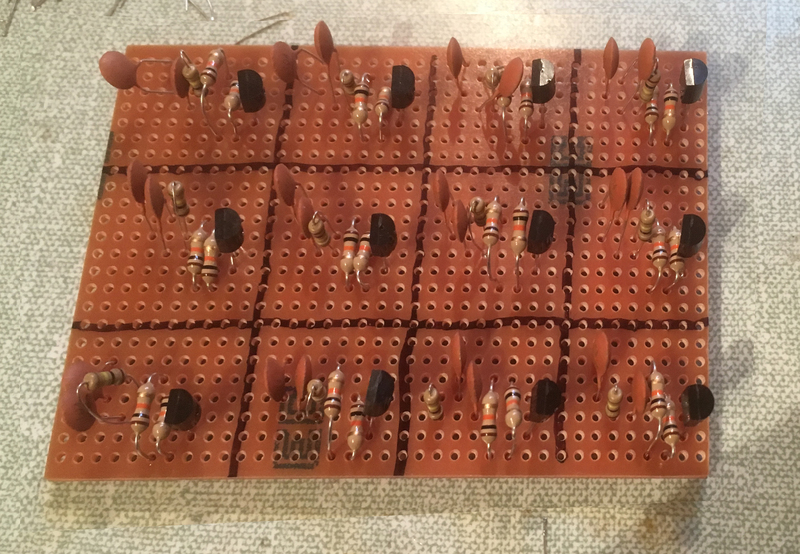 I made up a batch of them all at the same time on a spare piece of veroboard. 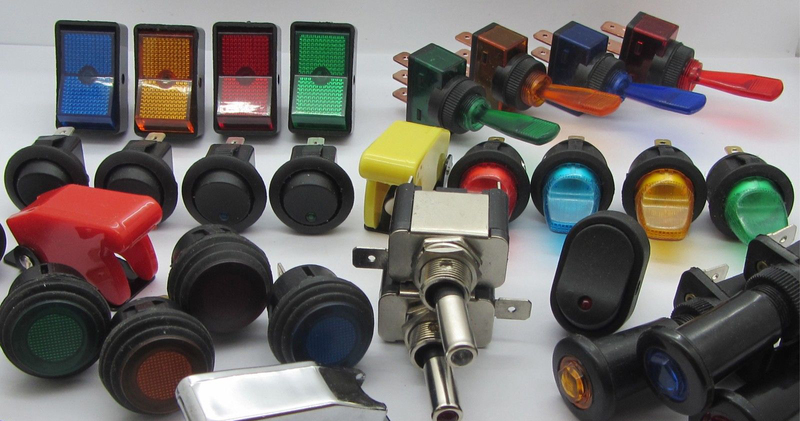 These 12 circuits cost no more than about £2 – £2.50 altogether. With this I was able to experiment with different microphone combinations. 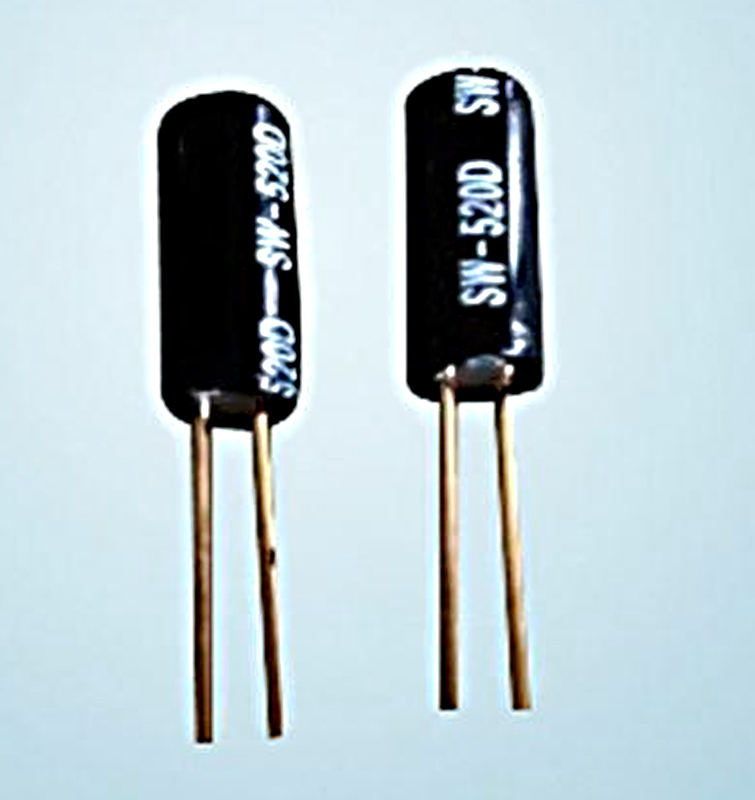 No other components were needed, except the electret capsules themselves. 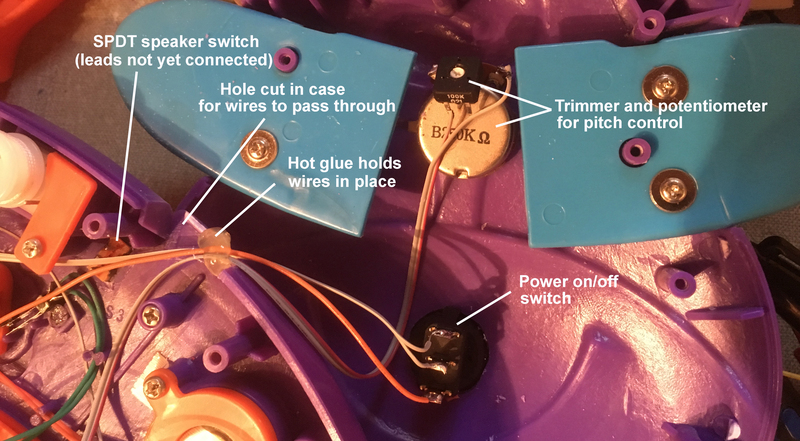 In some cases I connected the two wires from the capsule directly to input and ground on the board, at other times I attached input sockets. In all cases I was surprised at the quality of the sound I was able to get for such a low cost. The circuit also worked with the piezo mics/pickups I had made earlier, although the output didn’t seem to have as much lower frequency content. In the next article in the series I’ll describe some of the practical applications for which I used these electrets.